There are a huge variety of massage oils that have different properties and qualities. These oils are the most important part of the massage therapy and contain all the good values required for healing any pain. Of course the massage techniques are equally important and if you do not have a good masseur none of the body massage oils will be as effective. But then again there are some oils that you could also use on a daily basis all by yourself to maintain a good skin and healthy body. Know the exact purpose for choosing the oil. If you are looking for oil that will help you to treat cold and cough then you should choose eucalyptus oil, where as if you are looking for something that will give you a glowing skin then you should use almond oil. So the reason for the massage will determine the choice of the massage oil. Make sure that the oil is not too thick. The essential oil that you choose should be well diluted with carrier oil so that you have the right concentration for a massage. Check for any allergy or skin irritation that you might have before applying any oil on your body. If you are trying something new and are not aware of how it will react with your body then apply it on a small area and see if you have any reactions. If it is safe you could use it for a full body massage. There are broadly two types of oils, essential oils and carrier oils. Essential oils are concentrated and highly aromatic oils. 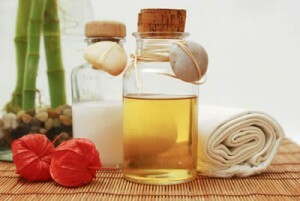 They are plant extracts and natural oils that are used for various purposes massage being one of them. Here are a few popular essential oils. This is one of the most effective essential oils. It has a great healing property that effectively cures any respiratory diseases and cuts and wounds. This oil will also help you to stay warm on the winters and cool during the summer. It has a great fragrance that lifts the mood and helps to fight anxiety or depression. This oil will also help to lighten scars and sooth the skin. Apart from these oils rosemary, peppermint, sandalwood etc are also very popular essential oils. Carrier oils are used along with essential oils to dilute the concentration and the heavy fragrance of the essential oils. Here are a few carrier oils. Almond oil is one of the most popular carrier oils. This oil is very good for skin it helps to retain moisture and provides a healthy glow. Jojoba oil is a great carrier oil because it has healing properties of its own. People suffering from a back pain could use this oil and it is also good for people with sensitive skin. Apart from these there are other body massage oils that are used as carrier oils, like coconut oil, avocado oil, apricot oil, sesame oil etc. This entry was posted in Massage on December 3, 2013 by author. Thinking about getting a massage? Here are a few things to consider before getting the right person for the job. These factors will help you in finding a massage therapist with the exact skills and experience according to your requirement. These are the conditions that will help you to shortlist the message therapists that you need for the particular reason. Every requirement stated above will need a specialized masseur who knows the right strokes and massage techniques. The gender of your massage therapist; whether you are comfortable with a man or woman giving you a massage. This is very important and needs a fair deal of consideration before you book a massage appointment. Consider the location of getting a massage. If you are most comfortable ay your home, then you will have to look for a masseur who will visit your place, if you are comfortable with visiting a spa, club or health clinic then you should look for such service providers. Also look for the distance between the spa and your home so that traveling to that place is easier. Find out professional massage therapists for the job, look for associations that are well reputed and have a good customer feedback. You could look for some names from friends, over the internet, health magazines, newspapers, yellow pages etc. Apart from all the above mentioned factors you should also consider the cost, extra charges like additional charges, if your massage is insured, if any advance payment is required, what are the clothes that you will be wearing during the massage, if there is any cancellation policy etc. all these factors combined together will help you in finding a massage therapist of your choice. This entry was posted in Uncategorized on November 30, 2013 by author. Shiatsu is a type of massage therapy that originated from Japan. The word “shiatsu” is a translation of the word “finger pressure”. It has all the qualities of the traditional Japanese manual therapies and gradually with time it has incorporated all the modern western technologies in it as well. Shiatsu massage therapy has techniques like acupuncture and anma massage that are traditional forms of therapy from Japan. This therapy was developed in Japan in the early 1900s and ever since it has grown in popularity all over the world. What is the theory behind this massage? The theory behind this traditional massage form of Japan is about the energy and its effect on the human body. According to them the human body is made up of energy called Qi. This energy is responsible for the smooth functioning of all our body parts. The free flow of the energy through the meridians [pathway of the energy in human body] keeps the body in good health. For any reason if there is a blockage or obstacle in the meridian then the constant flow of the energy is restricted. This is the root cause of the physical pain that we go through. The shiatsu massage concentrates on the vital points on the meridian so that the path gets clear for the energy to stream freely throughout the body and relieve any pain. What is the process of this massage? Just as the name suggests shiatsu involves a lot of finger pressure. Apart from the fingers, thumbs, hands, knees, palms, elbow and even knee is used to apply pressure on the vital points of the meridian to release any blockage. When you go for a session of this massage the therapist identifies the current situation of your Qi and designs the entire therapy accordingly. This therapy involves different massage techniques like kneading, tapping, stretching, pressure and soothing to unblock the points. This massage is designed to reinstate the lost balance of energy in human body. What are the benefits of this shiatsu massage? Here are some of the benefits that you will get from this traditional form of massage. Apart from all these, Shiatsu massage therapy will also help you to fight insomnia so that you could sleep well at night and start the day on a fresh and energetic note. This entry was posted in Massage on November 27, 2013 by author.